[/vc_column_text][/vc_column][vc_column width=”5/6″][vc_column_text]In this article, we try to shed some light at some pricing tactics that we encounter on a daily basis, so you could make smarter choices as a consumer. For entrepreneurs struggling with pricing, this will be a handy guide to avoiding some tragic/costly mistakes as well as getting ideas to test on your own business. There were 3 subscription plans. Which plan would you pick? He removed it and gave the subscription offer to another 100 MIT students. 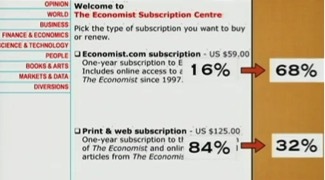 The picture below shows the change in subscription rate after the 2nd option was removed. Note that the basic plan became the popular plan instead of the 3rd option, after the 2nd option was removed. What happened? Contrary to belief, people don’t know what they really want. They are susceptible to and require external information to help them make that decision. So… the “useless” pricing option was not that useless after all? Conclusion: Always purchase what you need, not what you think is the best deal. Go to a supermarket and you will see prices ending with 9 everywhere. $49 vs $50, everyone knows that they are basically the same. Certainly, everyone can see that it is a marketing trick but … can they resist its effect? According to research from Quantitative Marketing and Economics, the answer is a definite NO. Prices ending in 9 works so well it even outsells the SAME product with lower prices. In an experiment conducted by MIT and University of Chicago, one women clothing item was tested with $34, $39 and $40. Surprisingly, items priced at $39 had larger sales, even more than $34 pricing. In short, given a similar situation, a price ending with 9 will still beat a cheaper pricing. READ How to increase sales? Learn this to avoid it. How to a sell a $14.90 meal? Next to a comparable $29.90 meal that you don’t even intend to sell. How to sell a $49.90 mobile plan? Next to a $200 premium plan hardly anybody signs up for. This is known as anchoring. Anchoring refers to the human tendency to rely too heavily on the first piece of information(the “anchor”) offered when making decisions. In fact, you can spot it everywhere. Go to your local pub/bar, you wonder if anybody every order that exorbitant drink. Go to Rolex, a $2000 watch looks cheap beside a $10,000 watch. Yet, that $2000 watch looks like a premium purchase when put beside a $200 Swatch. Here comes the interesting part – If you are an expert, you are less likely to be fooled right? Wrong. In a pricing research experiment, professional property agents were asked to estimate the price of sample houses with information of the house’s list price. Researchers manipulated the house’s list price, providing high and low anchors. Results: All the agents were influenced by the list price, yet they denied factoring list price into their decisions, instead claiming that the feature of the property justifies their estimates. When you encounter a range of pricing options, do you go for the “safer” option, picking the middle option? Well, you are not alone. 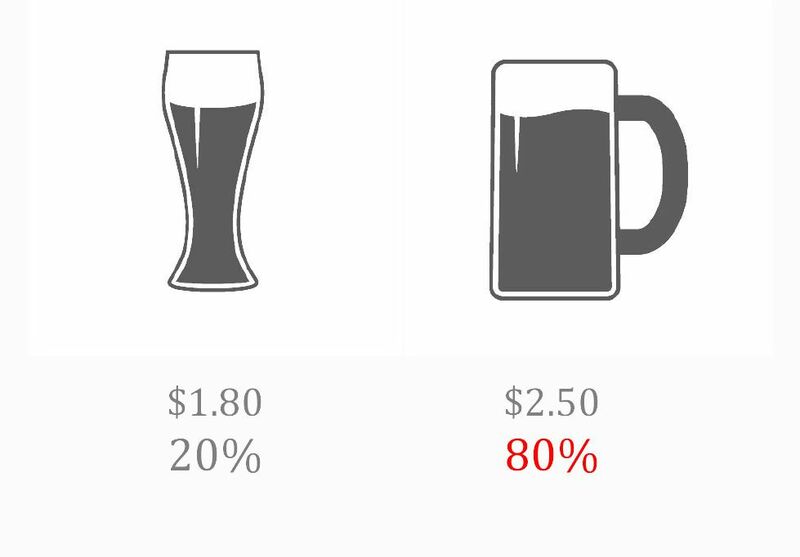 In the book Priceless, William Poundstone did a pricing experiment with beer. These were the initial pricing options the bar offers. 80% of the customers chose the premium offer. Would it be a good idea to capture a new pool of customer base by adding a cheaper option? Let’s take a look at case #2. Take a close look at the numbers. Assuming there were the same number of purchases, did revenue increase? Surprisingly, total revenue dropped! 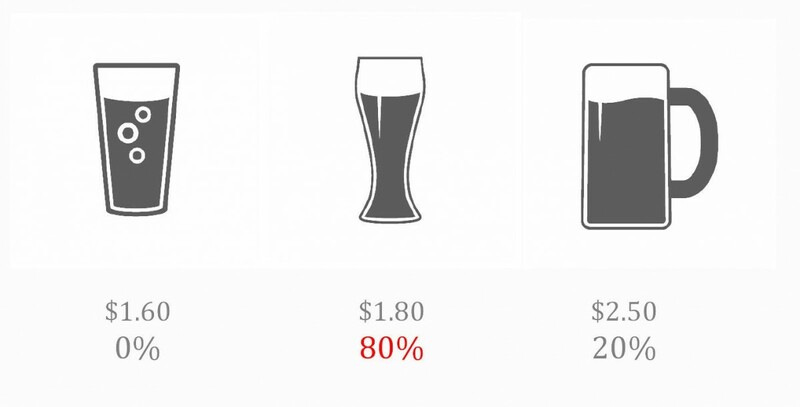 Luckily, we explored Anchoring and “Useless” pricing in this article. You guys can see clearly that when pricing tactic are utilised wrongly, it can cause a negative effect. Now in case #3, they removed the $1.60 beer and replaced it with $3.40 beer. In the end, more people chose the premium beer than before. Interestingly, there are always people who are willing to fork out more for the best, whatever the price. Which campaign do you think you are more likely to join? “Donate a dollar a day!” versus “Donate $365 a year!” ? Both campaigns ask the donor for the same amount of money. Yet, the former is more successful. This is because people compare what they have to spend with what they can buy. 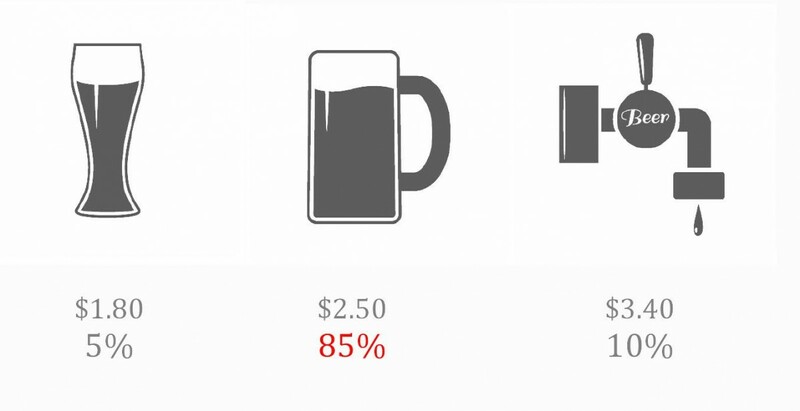 A dollar is about the same as a cup of coffee but $365 can pay for a new phone. Time is an entity poorly grasped by humans. As such, it is important to frame a price such that its pricing perception is within a reasonable range. How can buying a coke for $5 be reasonable? In a bar with enjoyable ambience where they “normally” sell alcohol. Alternatively you “create” a “new” category by changing product name from coffee to Americano. Writing names on coffee cups. Change whatever you can so that people have no reference to fall back, eliminating perception altogether, creating a new price category. Conclusion: Focus on what you are paying for, if that is your focus. For entrepreneurs, understand and improve the perceived value of your product. – People used to download music for free. Steve job convinced them to buy. How? By charging 99 cents. – Sales increase when the price tag changed from $50 to 50. – 90% of shoppers intuitively moves in an anti-clockwise manner at the supermarket. Spending more in the process. No one knows why. Interesting concepts for both consumer and entrepreneur. I thought 49.9 would have sold better than 49. Very interesting read. But please fix your grammar… or get someone to fix it for you. Very interesting to know about pricing on a product and to check with respect to consumer and entrepreneurs perspective. Good to know. Good and informative points – thanks. Stores force you to flow through in a counter clock wise motion. Thats why! Actualy case #2 under 4 can be a good thing. 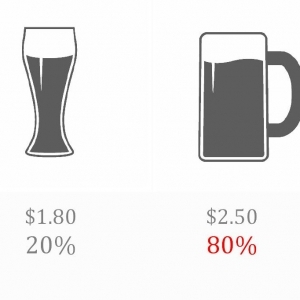 It depends on the retail price of the beer (your cost). Middle option provides you with 60. per 10 cl while right option gives you 50. per 10 cl. The bigger question is whether this would influence the volume sold. Thanks for the article. Someone shared the link on chat group. About the anti-clockwise direction, I read that in most of mini markets, people go from left side to right side, if i’m not mistaken. It makes the statement fails. I’m not really sure which is the most common of both conditions. Thanks for pointing that out! As we were writing this article, there were statistical evidence, neurological research, neurophysiological research and empirical research all pointing to different directions. In the end, we chose the one that is widely cited. I guess we can only agree that human behavior is too complex to fully understand yet simple enough to manipulate. newsletter service. Do you’ve any? 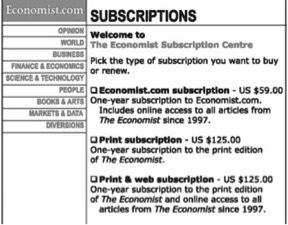 Please allow me know in order that I may just subscribe.